The South Bay Creek property includes 50 acres of prime farmland. Robert Rodriguez, Jr. In addition to protecting land of extraordinary biodiversity—forest, farmland, meadows, clay bluffs, frontage along South Bay Creek and adjacent wetlands—acquisition of this property safeguards Olana's magnificent views, ensuring that the 170,000 annual visitors to the home of renowned Hudson River School painter Frederic Church admire the very vistas that inspired him. A top regional tourism destination, Olana State Historic Site generates $7.9 million of economic stimulus each year in surrounding communities. 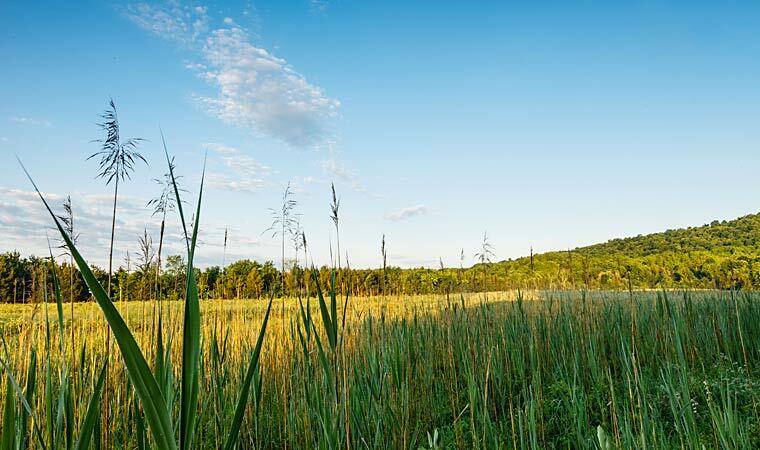 The transaction also conserves 50 acres of USDA Prime Farmland and Soils of Statewide Significance, so they can continue supporting Greenport's agricultural economy. The transaction forms a contiguous tract of open space encompassing this property, the Rip Van Winkle Bridge, Mount Merino (including 100 acres purchased by Scenic Hudson in 2008 and later transferred to NYS Parks) and Olana, enabling creation of an off-road trail that eventually could span from Catskill to Hudson. The property also could provide an opportunity for paddling and fishing in South Bay Creek, increasing its recreational use in hopes of diminishing the feasibility of environmentally destructive proposals for South Bay.